You’re finally leaving! Just a few days to go and a huge schedule to organise. But… where do you start? The internet, of course. After two hours spent reading travel blogs, conflicting reviews of hotels and restaurants (are they reliable…? ), rankings of the best 5 places according to online magazines, advertisements for self-styled paid travel designers, all you want to do is call a friend so that they can tell you what to do. A friend who likes the same stuff as you and knows how to choose the hottest spot, the tastiest dish and the most fun trip. That’s how Alternative Guide was born. We’re all different and we all travel for different reasons: some of us love sport, there are those who never miss a show, who have no time, who pick their next stop according to culinary experiences, those who prefer shopping, who enjoy exploring stories of places and people. That’s why Alternative Guide offers a collection of different points of view on the cities of Florence, Venice, Bari, Verona, Bologna and soon Munich. 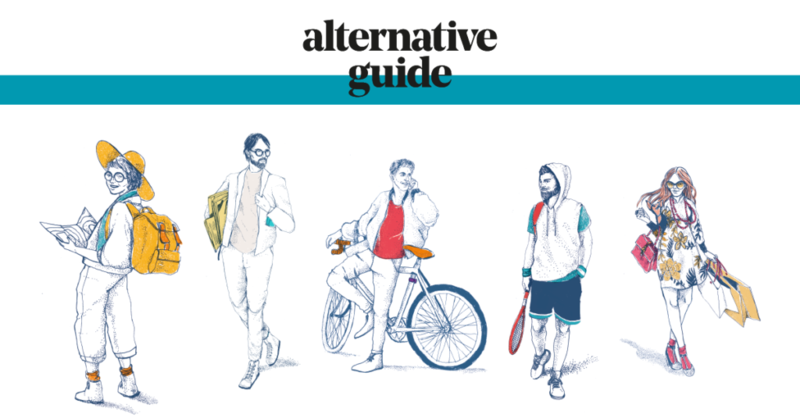 The aim isn’t to replace traditional guidebooks (there’s a reason we call it ‘Alternative’! ), but to give you that little bit extra insight. Five characters are tasked with creating a cultural bridge between Italy and Germany, passionately connected to our flight routes. They fully reflect our cosmopolitan, dynamic and demanding passengers. That’s Alternative Guide in a nutshell. It’s the best way to make a good impression on the friends you’ll be spending the weekend with, to make a hit with that girl who is finally joining you on an out-of-town trip or just to enjoy some good reading to complete your holiday travel experience. Through the eyes of the Storyteller, the Sporty Type, the Intellectual, the Socialite and the Traveller, you’ll discover the spirit of these places just as if a friend were describing them to you.